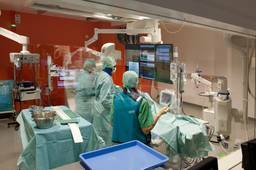 The Cardiology Department conducts considerable scientific research and has been recognised for its work by the Belgian government. Numerous cardiologists from all over the world train here too. To support its research activities, the Department has its own Cardiac Research Fund (sponsored by the King Baudouin Foundation), and several of the Department's staff are key opinion leaders, running courses and both chairing and speaking at many international conferences. Fellowships are offered in this centre. Read more under "Fellowships". Each year, the department performs approximately 900 cardiac surgical procedures, 1100 vascular procedures and 180 lung surgical procedures. The credo of the department has always been “act fast; adopt the newest technology”. In 1988, the department performed its first cardiac transplantation; in 1990 it performed its first implantation of a defibrillator; and in 1995 it implanted its first artificial heart awaiting the availability of a new (donor)heart. At present, the department performs over 200 implantations of defibrillators and pacemaker on an annual basis. Since 1995, the department has progressively implemented various laparoscopic surgery techniques – often involving the use of the heart-lung device – for various heart surgery procedures, including: robot-assisted bypass surgery, arrhythmia surgery and valve surgery (laparoscopic, via the groin,…). Building on its expertise in this area, the department now performs approximately half of all cardiac surgery by using laparoscopic techniques. This evolution is even more pronounced in vascular surgery, where almost 75 per cent of all surgical procedures are performed by puncturing the blood vessels, thus avoiding incisions. This approach is valid for both widened (aneurysma) and narrowed blood vessels. In the area of lung surgery, too, laparoscopic techniques have become common practice. It goes without saying that these evolutions offer great benefits for the patient, who can now enjoy a strongly reduced pain experience, faster recovery and consequently a shorter duration of hospitalization. The department’s surgeons and their patients can rely on a support team of 8 technicians, who act as the ‘bridge’ between the patient, the referring practitioner and the physicians of the OLV Hospital’s department for Cardiovascular and Thoracic Surgery.